A Girl, a Motorbike and Dystopia. 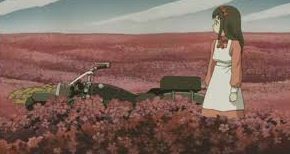 All The Anime bring us Ryutaro Nakamura‘s ( Serial Experiments Lain) 2003 groundbreaking esoteric story of a young girl travelling the lands of an unknown world on her speaking motorbike (a Motorrad). 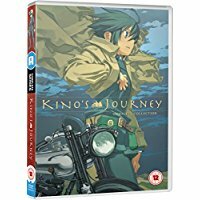 Kino’s journey is more about Zen than your regular anime (of which there are many genres) as Kino sees all that her world can give her or take from her. Kino lives in a world where each area has its own ruler, laws and beliefs which may conflict with their neighbouring lands. She travels these lands on her motorbike Hermes. 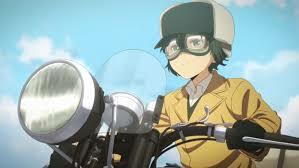 The pair of them share a bond for life as Kino provides balance for Hermes and Hermes offers speed for Kino’s journey. As she continues on her journey she comes across a city with highly developed servile machines but no humans. She enjoys their hospitality as she stays for her mandatory three days. 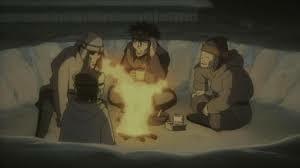 She later finds the human populace living outside the city walls and all living separately due to their technology which allowed them to hear each other’s thoughts, but knowing all thoughts is not good or healthy for humanity. For a young girl she spends a lot of time cleaning her pistol and practising her quick-draw at every opportunity. This is the world she lives in, danger has plagued her since her twelfth birthday when her life was turned upside down. Follow Kino as she has to deal with Human traffickers, mindless tasks, catastrophic prophecies, death and also the hospitality of her fellow humans, plus many more thought provoking dilemmas.